In 2003 , ye old Texas Skunk along with Ms Skunk took a cruse through the Panama Canal. These are a few of the photos taken. We departed Miami at sunset…….. The ship enters the canal lock and it is closed behind it. The engine on the right actually tows the ship in. You can see the cables running to it. Water is then pumped into the lock raising the ship to the next level. The water lever in the lock to the front is the level this one will be raised to. Once you are out of the locks you enter the canal which feeds into a large lake. From the lake, you do the same thing again, but obviously in reverse. These Towel Creatures were great to find in your cabin every night. Many times personal items such as sun glasses were incorporated into the design. The water at some ports was too shallow for the ship to tie up at a dock so we had to use motor launches to get to shore. 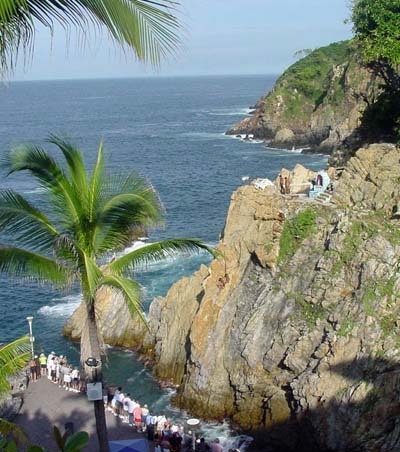 This is where the Cliff Divers perform in Acapulco. Making tortillas the old way. Using a comal or flat iron griddle. Hard work but were they good! Ms Skunk loved the shopping and came home with a bunch of silver stuff.